Yokohama was a small fishing village up to the end of the feudal Edo period, when Japan held a policy of national seclusion, having little contact with foreigners. A major turning point in Japanese history happened in 1853, when U.S. Navy Commodore Matthew Perry arrived just south of Yokohama with a fleet of American warships, demanding that Japan open several ports for commerce, and the Tokugawa Shogun agreed by signing the Treaty of Peace and Amity. This opened Japan to the world, and Yokohama has served as a gateway to the Land of the Rising Sun for over 150 years, welcoming people and cultures from the West. Over the years, the Hotel New Grand has welcomed many famous dignitaries and celebrities through its historic doors, including Charlie Chaplin, Babe Ruth, the Duke of Gloucester, and more. The famous Japanese master writer, Jiro Osaragi, was a resident of Hotel New Grand in room 318 for more than 10 years. The classical form of the original Hotel New Grand harmonizes gracefully with the sophisticated modern design of the newer annexed Tower built in 1991. Traditional elegance and modern design blend within the hotel’s two buildings, and guests are sure to find accommodations best suited to their needs. History and culture emanate from this Yokohama hotel and create a treasured ambiance only found at this spectacular location. 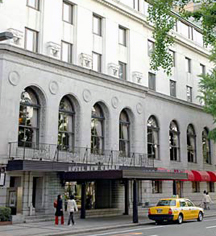 Hotel New Grand, a charter member of Historic Hotels Worldwide since 2012, dates back to 1927. The hotel has had many famous guests including Unites States General Marshall MacArthur and Japanese author Osaragi Jiro. Cancellation Policy: Cancellations for a guest room reservation must be received at least 24 hours prior to the expected date of arrival (Japan time). Policies may differ by arrival date and room type. One day prior to reservation: 20% of accommodation charge. Same day of reservation: 80% of accommodation charge. No-show (failure to inform hotel of cancellation): 100% of accommodation charge. Early Check-In/Late Check-Out: Available, depending upon availability. If you expect to arrive early in the day and would like immediate access to your room, the hotel recommends booking for the prior night to guarantee immediate access. Similarly, for late departures, reserving and additional night will guarantee access to your guest room until your depart. If you choose not to reserve, you are invited to store luggage and enjoy the facilities until your check-in time or after your check-out time. Payment: All forms of payment are accepted. Payment is required at time of booking. Visa, MasterCard, Amex, Diners Club, China Union Pay, and JCB are accepted. 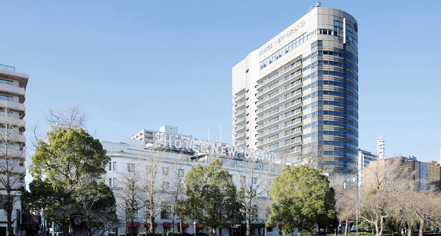 Designated a historic monument and considered one of the oldest western-style hotels in Japan, Hotel New Grand is the epitome of Yokohama history. Established in 1927, Hotel New Grand is an international hotel that has welcomed guests from all over the world. Learn more about the History of Hotel New Grand .